Walt Disney's Snow White and the Seven Dwarves, the one that started it all. 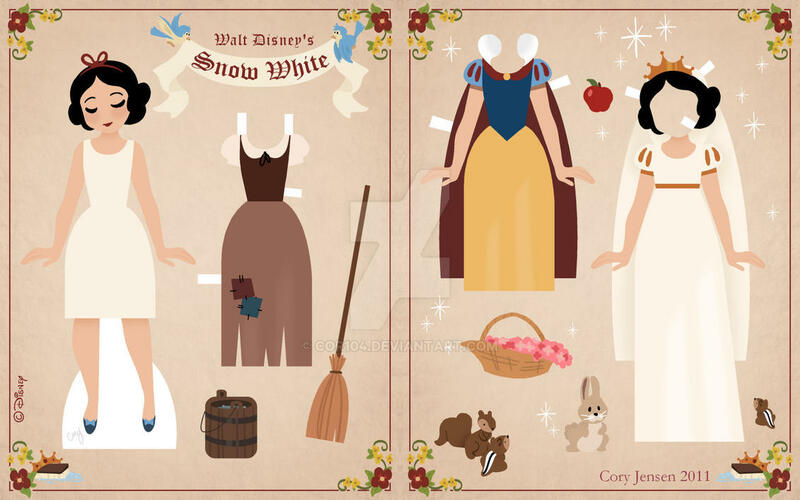 I wasn't happy with my original Snow White "Retro Paper Doll" so I have re-imagined it in the same style and layout of the Cinderella doll. I'm quite pleased with the result. Hope you all like it too! 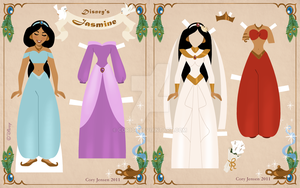 I am working on several paper dolls at the moment of the Disney princesses in this style. What do you think? Love this and the Cinderella! Can't wait to download! She's so sweet and cute!! ahh this is amaazing! great work!! That's super-cute! I kinda like her ragged dress best, the "pretty dress" have wierd colours. BUt it was more beautiful in your style. I'm in love with that bunny on the bottom of the page!Adorable. She's very cute! Can't wait to see more of this series, I really like these! Thanks! I love those doll because they have their "daywear" (haha) most of the dolls just have their "princess" gowns, but their usual clothes are beautiful too! This is so adorable! I like that you put her in the same style as Cinderella, it seems to fit her better. Great job Cory! Keep 'em coming! Thank you very much! 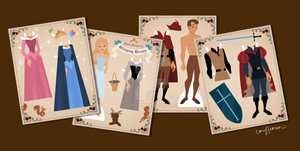 I can't stop making paper dolls lately! And you shouldn't stop! You're on a roll!!! Such a cute wedding dress!! Love thiiiis! Thank you! I love her wedding dress, whish it made it in the film. Lovely job! Especially given how few choices that particular disney movie gives as far as costume choice is concerned! Thank you! 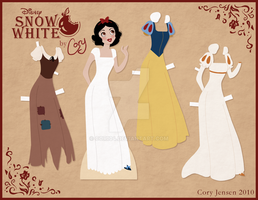 Luckily, there is some lovely concept art for Snow White with a gorgeous wedding dress! Sweet!! I would love to see them all!!! Thank you! There will be at least 2 more...but most likely more than that!